Queue the Omara Portuondo and read on! Over the last decade, Santa Maria Novella seems to have less and less of a presence in the U.S. Do you, perfume fanatics, anxiously await a new Santa Maria Novella fragrance? I was not even aware of the latest Santa Maria Novella release: Cinquanta. Out of smell...out of mind? After wearing a slew of dull new releases, I realized I've forgotten to review some old favorites, like Santa Maria Novella Acqua di Cuba. I first bought Acqua di Cuba in Florence at the old Officina Profumo Farmaceutica di Santa Maria Novella near the Basilica of Santa Maria Novella. Want to discover the LUSH of the 17th century? Visit that aromatic shop! When confronted with the huge array of perfumes in front of me (and the overwhelming distractions, olfactory and architectural, in that gorgeous environment) I asked the sales associate to let me smell the top-five sellers. In Italian fashion, she ignored four and went directly for an easy-to-reach bottle of Acqua di Cuba. I sniffed. I fell in love. I purchased. Over the years I've owned several bottles of Acqua di Cuba. In the mid-2000s, when the reformulation craze began, I was afraid to sniff Acqua di Cuba again; I filed it under Great Memories and left it at that. A few weeks ago, I received samples of current Acqua di Cuba; it made it through IFRA alive. Acqua di Cuba goes on smelling damp and liquor-y with rich, fumy citrus peel and juice aromas; the perfume has a spicy-herbal bite (clove? ), but its ingredients are ghostly to me...I can't pin them down. I smell barbershop elixirs (aftershaves and colognes and powders) mixing with dry, blond tobacco leaf, tropical woods and incense. There is a bright spot in Acqua di Cuba's trajectory — a note or accord that smells like a jungle flower (fleshy, sticky-sweet, temperamental) — Will I give you my perfume at midday or at midnight? Acqua di Cuba is "clean" in the Old Style, when perfumes and toiletries had oomph; it has no contemporary/beige"fresh" attitude. Acqua di Cuba makes me 'think pink'...and canary yellow, turquoise and vermilion. Acqua di Cuba is not afraid of attracting attention (and you shouldn't be either, if you wear it). Acqua di Cuba smells wonderful throughout the day; it has great tenacity and good sillage. A long, hot summer is the perfect time to indulge in Acqua di Cuba. Listen to one of hundreds of great Cuban musicians — Esther Borja, Celia Cruz, Roberto Faz, Beny Moré, Toña la Negra, Albita Rodriguez, Olga Guillot — sip a Cuba Libre...or three, then, when appropriately uninhibited — mambo! 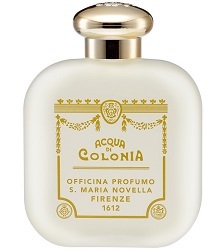 Santa Maria Novella Acqua di Cuba is $125 for 100 ml; for buying information, see the listing for Santa Maria Novella under Perfume Houses. 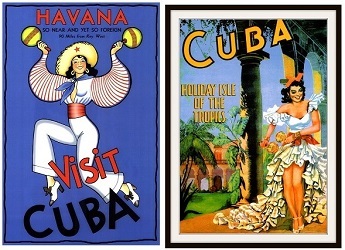 Note: top images of vintage Cuba travel posters via the Science Museum of Long Island. I want to go mambo too! I’ll google the clip. Was being literal. ???? I find SMN’s Tobacco Toscana to be an airier and less sweet version of Chergui, while Acqua di Cuba (which I admit to only having tried once) reminded me quite a bit of Fumerie Turque. I find the first two friendlier and more easy going, but perhaps that is because they are less masculine than the other pair? Merlin, I agree the Lutens are more masculine…need to try the Tobacco Toscano again. This is so funny! I was walking up Lafayette St in NYC last Friday and spotted the SMN store out of the corner of my eye. Beeline. This is the one I sprayed on myself. I liked it a lot, but I wish I hadn’t been so tentative. I needed a heavier hand. Lizzie…I LOVE to be ignored in perfume shops…I get so much sniffed that way. I know… Same here usually. I was kind of concerned she might want to help me me since I was the only one in there for a few minutes. I wandered there too with Daisy a hear or so ago. If it is anywhere near Osswald, I may stop in before the meet-up, assuming we’re meeting at Osswald. Ok never mind, no Min for me anytime soon. Thx TGR! See you next week! There is a lovely SNM Boutique in Chevy Chase, Maryland (near the Friendship Heights Metro Station and Mazza Gallerie in DC). When I was there a tall, handsome SA offered to assist but also left me alone when I wanted to just browse. I’ll try Acqua di Cuba the next time I go. I bought Melograno and enjoy it fairly often. It’s “clean” in the sense of smelling slightly like Ivory soap and a bit like sandalwood. It smells very good without being terribly conspicuous. I have to be careful not to over-apply. Noz…Melograno is a good one. A tall and handsome SA + wonderful perfumes=heaven! And Cuba — I had a nice visit there 5 years ago and I want to go back before it gets overrun by more tourists. Unless improvements are made quickly and in a big way, the infrastructure will collapse. In fact, I would probably only do it via cruise so I don’t have to be concerned about accommodations. I think I remember reading in Luca Turin’s Duftnotes about one or two wonderful niche perfume shops in Florence. Undoubtedly more by now. I’d be of two minds. On the one hand, it’s easy to find SNM in the U.S.; on the other, the original shop looks fabulous in photos. I hope you’ll report back! I will. Right now, I am without a passport as I just sent it in as part of the renewal process. Thanks for this review, Kevin! Acqua di Cuba has been on my to-sample list for a long time, and this is a good reminder to go forth and actually *sample* it! I wish I’d known about Santa Maria Novella when I was in Florence years and years ago; it’s a great house. I wear their Caprifoglio cologne all summer long, and keep it in the fridge during heat waves for refreshing splashings. Isabella: you’re welcome…hope you get to smell it soon! Having our first 80 degree day in Seattle tomorrow…think I’ll wear it. Kevin, I love their patchouli and do give it a try if you like a real dirty and authentic patchouli. It’s simply irresistible. I too get lost in their other offerings at their NYC flagship on Lafayette. The iris toothpaste is nice as a guest bedroom bathroom treat. And, the naturally scented clay stone rock will scent your entire home for a year. Who knew one clay stone could do so much, haha. You’ve inspired me to pop in this weekend. The clay stone sounds fabulous. Making a mental note.